Graduate. Get a job. Get promoted. Climb the ladder. Succeed. That’s what most students think life after college is all about. Three alumnae recently spoke to Dr. Wilfried Iskat’s Introduction to Lodging class at Rosen College about the unexpected curves and swerves that come after graduation and how to make the most of the journey. 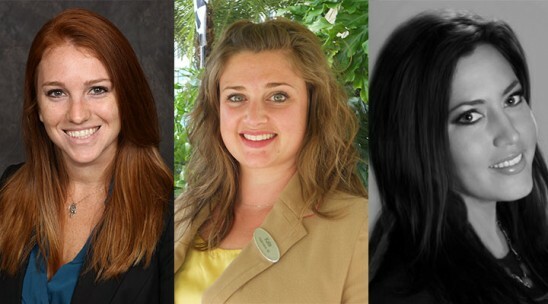 Jamie Realander, ’11, Kate Thomas, ’05 and Jennifer Garcia, ’09 all traveled unconventional paths to their current jobs, but found that their experiences helped them realize their true potential and discover their professional passions. Realander hopes the future holds the opportunity to open her own boutique hotel and credits Rosen College for guiding her in the right direction to someday realize that goal. She encourages students to make the most of their time before graduation. Thomas, a marketing manager for the Hyatt Regency Orlando, found herself doing work she never expected on her way to her current position, including human resources, revenue management, digital media and e-mail marketing. Thomas stressed the importance of volunteering for projects and trying new things, despite lacking prior education and training, in order to continuously learn and provide value to your employer. Garcia says Rosen College taught her to dream big and reminded students to believe they can achieve their goals even if they can’t see a straight path to success. Garcia currently works for the Florida Panthers hockey team as a client management specialist, but infiltrating the sports industry proved difficult despite her persistence. With aspirations to become the senior vice president of events for the NFL and produce the Super Bowl, she encourages students to prepare for professional rejection, no matter how focused or accomplished they are while pursuing their degrees.